Similac Formula Recalled Over Beetle Contamination : Shots - Health News The Food and Drug Administration says the formula containing the bugs poses no immediate health risk. But infants who drink it could get stomachaches that might lead them to refuse food. Bugs may be the latest culinary treat for some, but we don't think it's a good idea for kids to be drinking formula contaminated with beetles and their larvae. Neither does health-products giant Abbott, which is recalling about 5 million containers of Similac powdered infant formula because of possible insect contamination. The Food and Drug Administration says the Similac containing the bugs poses no immediate health risk. But infants who drink it could get stomachaches that might lead them to refuse food. So, as a precaution, Abbott is recalling certain Similac lots distributed nationwide, as well as in Puerto Rico, Guam, and some Caribbean countries. 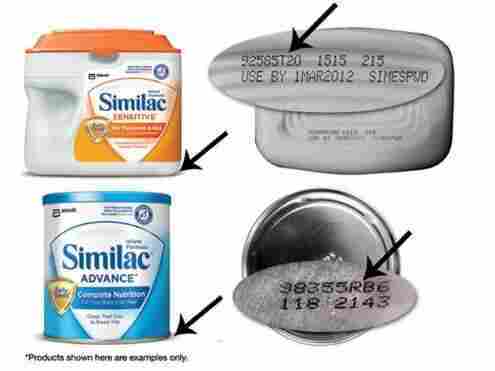 If you're wondering if the Similac on your shelf is part of the recall, you can check the lot number here. None of the company's liquid formulas are affected.